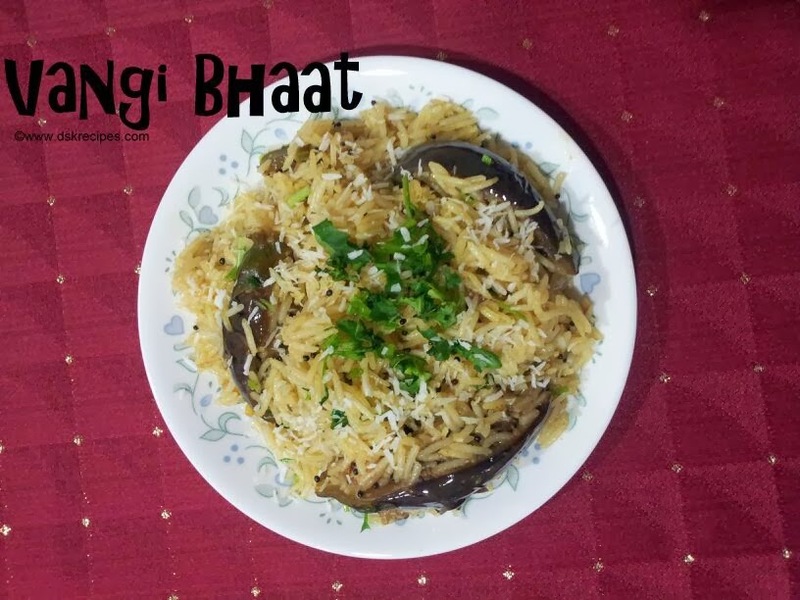 Vangi Bhat / Eggplant rice is Maharastrian dish. Its quick to make and tastes great. Fresh flavour of Vangi / Eggplant with spices all absorbed by rice giving nice flavour. 1.Boil and keep 2 cups rice aside. 2. Take 2 to 3 brinjals and cut them into long thin slices. Soak them in water for few mins. 3. Chop onion and garlic cloves into fine pieces. Also grate the ginger piece finely. 4. Heat oil in a pan. And add mustard seeds to it. 5. Once the seeds crackle, add turmeric powder, curry leaves, grated ginger, chopped garlic and onion. 6. Saute it for few mins until onions turn little pink and add asafoetida, cumin powder, coriander powder and garam masala. 7. Saute it for another few mins and add cut brinjal slices to it. Mix it well and keep a lid on the pan for the brinjals to get softer. 8. Dissolve the tamarind paste into 5 tsp water and pour this mixture onto the brinjals. Add 1/2 tsp sugar. Saute and let it cook. 9. Once brinjals are well cooked add the boiled rice into it and mix all the ingredients well. Let the rice cook on low heat for few mins. 10. Finally add chopped cilantro and grated coconut and serve hot ! !